My newest obsession (which I’m sure will last about another week, as it seems I can only sustain a hobby for about 2 weeks at a time) is hand embroidery. I guess I first learned how to stitch when I was a kid from my friend’s mom. She was this awesome June Cleaver-style mom who made all kinds of crafts and sewed clothes for her kids. And me. Well, I got one T-Shirt dress that was splatter painted with neon pink and blue. And let me tell you, I wanted that dress so badly. And once I got it, I WORKED. IT. No round little girl worked neon like I worked neon. So I vaguely remember her teaching us the easy stitches, and I vaguely remember not really ever figuring out anything but a running stitch. But look at me now. 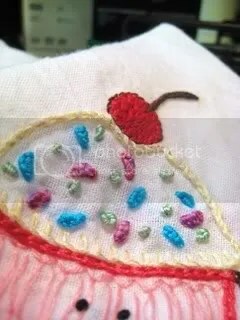 All of these are awesome resources for know how and inspiration of what embroidery can be. Meaning; it can be more than those daily chore kitten tea towels your mom had. Not that those aren’t actually adorable. At least my Mom’s are. Side note: Disneyland makes me so excited it’s all I can do to keep myself from peeing. And can I ask all you out there how do you keep the back of the tea towel from looking like the embroidery floss aisle vomited on your work? Am I the only who doesn’t know how to plan ahead well enough? Is there some secret trick? Do they all look like this? I mean, that looks like the evil demon soul of the cupcake and pie. This entry was posted on January 7, 2009 at 4:29 am and is filed under Uncategorized. You can follow any responses to this entry through the RSS 2.0 feed. You can leave a response, or trackback from your own site.